Makerspaces are becoming more and more popular. If you are not familiar, a makerspace or hackerspace is a place for people to gather and make stuff. Each is pretty much unique, but they all share a sense of community and a joy for making things and sharing knowledge. However, even if you are lucky enough to live close to one, it may not be particularly kid-friendly. So, where should you take your young makers when they want a place to turn their ideas into reality with their own hands? That’s an excellent question. So I did some research and here are five great places you can go with you kids to make things. Two of the largest home improvement brands in the United States are Home Depot and Lowe’s. Home Depot offers a new free Kid Workshop on the first Saturday of every month. The projects are generally designed for kids ages 5 to 12 years, and you can show up anytime from 9am-noon. Check the schedule on the Kids Workshops tab at their website. 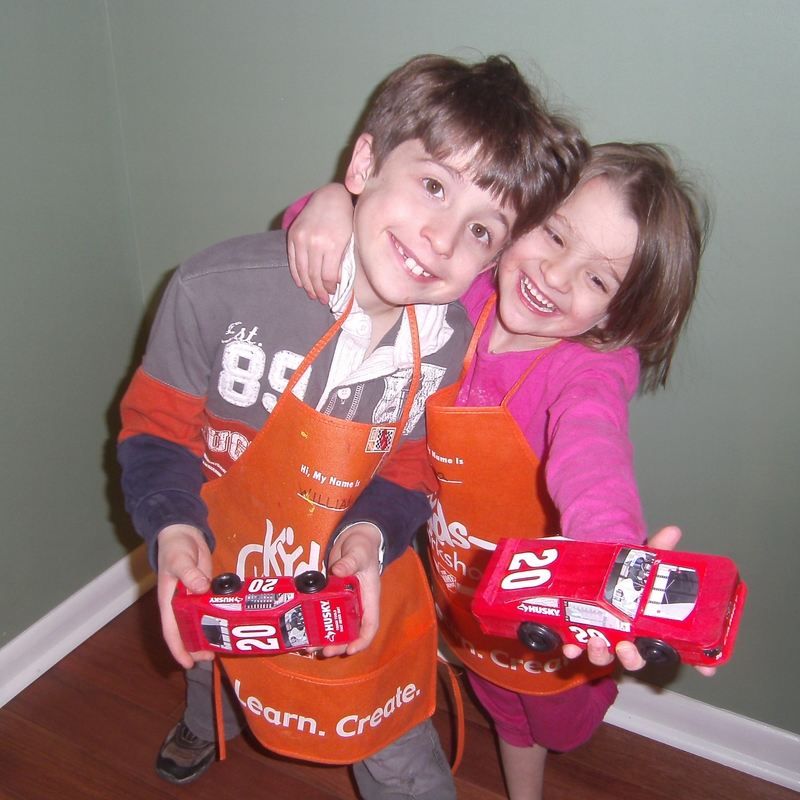 Their first time, kids receive their own work apron, and they get a new pin with each project. I’ve attended a couple with my kids and they are lots of fun and pretty easy to complete within an hour. My son made a birdhouse the first time and then he and his younger sister made race cars the second time. Lowe’s runs their own free kid clinics called Build and Grow. Unlike Home Depot, you will need to register your child to attend. I found the next two scheduled clinics are already filled up at all of the Lowe’s in my areas. So you will need to do some advanced planning for this one. Ace Hardware also runs the Ace Kids Club. Register your child and they can come in to a participating Ace during the month of their birthday for a special surprise. You may find that your local Ace doesn’t support the program, but go ahead and ask if they do. Perhaps if there is enough local interest, they’d elect to join the program. Also talk to your local hardware store, building supply and or home improvement center. You are less likely to find regular workshops there, but you never know until you ask. A local business owner might like the idea of bringing traffic to his or her store by running a workshop. Michaels offers crafting classes for kids that vary in topic and age range. Costs are from free to inexpensive, depending on the class. Many listed at my local Michaels were only $2. The Duck Tape Class was the most expensive this month at a mere $15. Michaels also offers a Kids Camp in the summer or you can throw a birthday party where the kids do crafts. Another large craft chain, A.C. Moore offers hands-on demonstrations and “Make & Take” projects. A.C. Moore also lets you schedule your own craft party. Check your local store for a schedule and to see what classes are available. Not all locations have specific classes for kids. Jo-Ann Fabric and Craft Stores offer classes for kids and teens. Their “Simple Sunday Make It-Take” classes are available at all stores, except Paramus, NJ. Sorry, Paramus. You may find a local or regional craft store offering kids classes like Pat Catan’s Craft Centers in Ohio, Pennsylvania, and Indiana. My kids and I love science centers and kids museums. We visit new ones whenever we can. If you don’t have a big center or museum near you, consider including one in your next family vacation. If you live in a major metropolitan area, you may have a world class science center or children’s museum available to you. Many have hands-on activities, so check their schedules. My family just attended an overnight “Camp-In” at the Franklin Institute in Philadelphia with our local Cub Scout pack. The event included a “Design Quest” challenge where kids were encouraged to experience the design-build-test-redesign cycle by completing a series of three challenges. I was so proud when my daughter’s design for a vehicle that would float in a wind tube worked perfectly on the first try. Don’t be discouraged if you don’t have a major museum near you. Try looking in your local paper or searching online for museums close to you. You might be surprised. A couple of years ago, I was randomly searching the web for things to do with my kids when I found there was a small, volunteer run children’s museum just ten minutes away from our house! I had lived in my town for years and I never knew it was there. We’ve since been there quite a few times, and I have even taught a couple of kids’ robotics classes there myself. Smaller museums may have more limited choices, but they can also be very interesting, are usually inexpensive, and they help support your local community. OK, this is a bit of a catch-all. For the previous categories, I tried to include specific recommendations or links to places that many readers will have access to. My research didn’t find places like that for this category, so you’ll have to do your own legwork. Hopefully, one or more of these ideas will spark an interest. There are lots of possibilities, below are just a few. Try a paint-your-own-ceramics place where you can decorate unglazed pottery and they will fire it for you to pick up later. A web search for ‘paint your own pottery’ or ‘paint your own ceramics’ should net you some results. If you are really adventurous find a place where you can “throw pots” on a potters wheel. See if you can find a cooking class for your kids. You might find anything from a single session monster cookie making activity to a full program like the Kids Cook! Summer Camp in Baltimore. Check online reviews before you book a class, as prices, class content and quality are sure to vary. Check out places with art programs like Time for Art in Cary, NC, Gabriel’s Art Kids in Bellingham, WA, or Kids-N-Art in Frisco, TX. 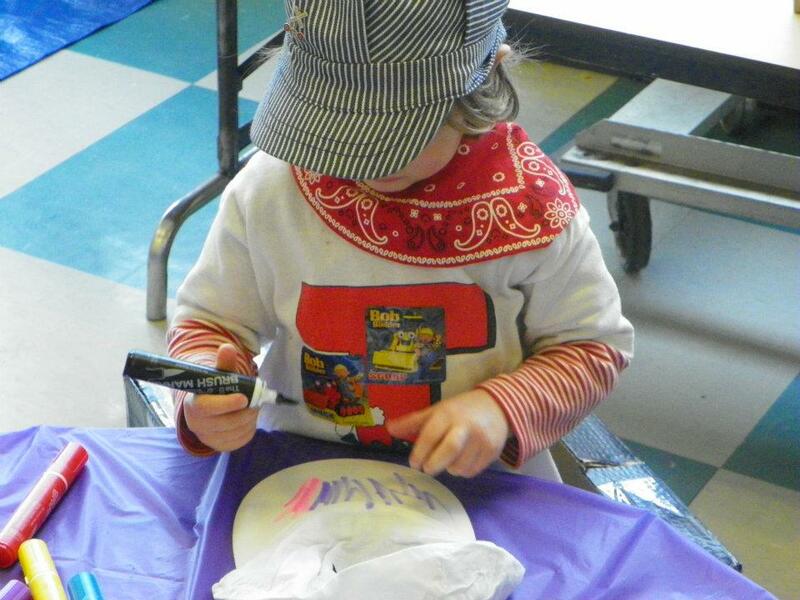 There are art programs for kids in many cities, including workshops, summer camps, and classes. If your kid is a budding artist, see if there’s a program near you that fits their needs and your budget. There are a growing number of businesses that have some flavor of educational enhancement. Many of these may offer excellent opportunities for building and learning, like the Kaleidoscope Learning Center in Blairstown, NJ. Some are focused on child care, but also happen to have good educational content. Others may be private pre-schools, or alternative education centers that cater to home-schoolers or offer pre- or after-school programs. What I need to say here is, do your research. There are many great learning centers out there, but they are not all equal. Beware of child care centers that are just trying to service the maximum number of kids and are not focused on their content. Let’s bring this topic full circle. While hackerspaces and makerspaces aren’t so mainstream as to be easily available to all, they are out there. Some of them are kid friendly or have kid friendly events. 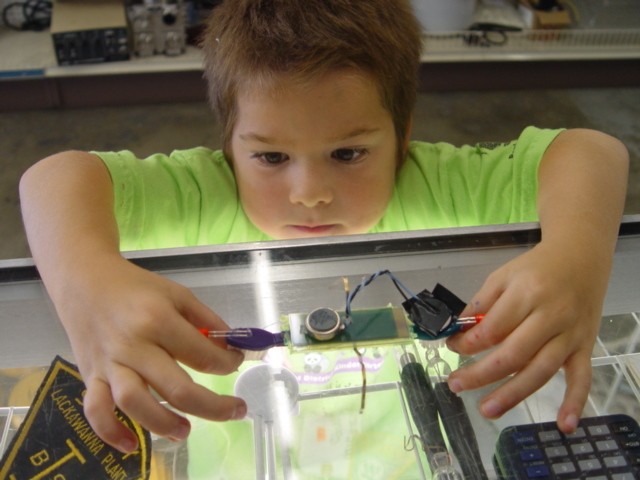 Many private makerspaces and hackerspaces are just not set up for kids. Some are concerned with increased liability for having people under 18 in the building. Others may just have an “adult atmosphere” that doesn’t cater to the younger set. However, there are exceptions. The Makery in New York City organizes pop-up makerspaces with youth oriented workshops and classes. The Reuseum in Boise, ID is a warehouse offering science, industry and government surplus items for sale. They also host workshops on building robots, using sensors, programming Arduino, and 3D printing. I found a growing number of public libraries offering a makerspace with programs designed just for kids, like the Make It Yourself program at the Piscataway Public Library. I think this is a wonderful way to re-invigorate our public library system. The Westport Public Library in Connecticut is another pioneer in library makerspaces. I found articles indicating that other libraries were leaning this way, including this piece about funding received by the Anythink Brighton Library to build a teen makerspace. Let’s not forget the oldest established, permanent floating makerspace in the world, Maker Faire! There are big events each year in the San Francisco Bay area, Detroit, and New York City. 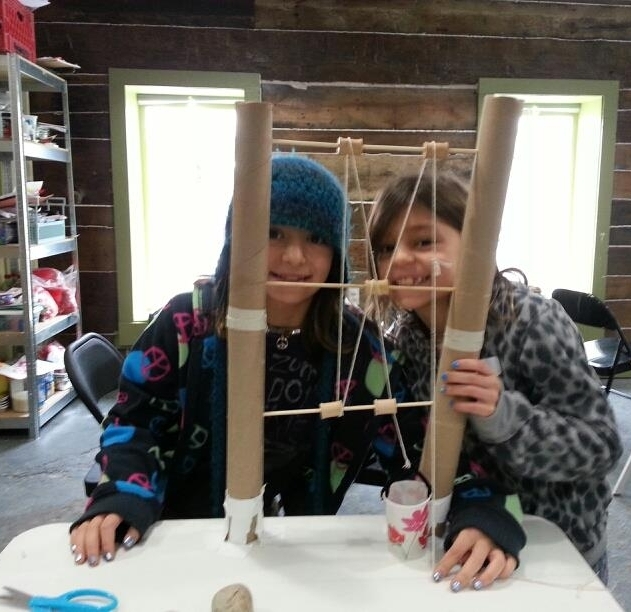 However, hundreds of mini-Maker Faires have been established throughout the United States and now all over the world. If you have never been to one, you owe it to yourself and your kids to check one out. This isn’t a definitive list, or even a top-five list. I also have no doubt that more and more opportunities for making will become available as the maker movement grows. In the meantime, I hope you discovered some new resources in reading this. If you have found some interesting and exciting places for your kids to express the maker in them, please share in the comments for everyone’s benefit!